Nuxe fans, we’ve got big news! Your favourite Rêve de Miel range has been expanded, and we’ve got the scoop on the latest launch. Because nobody likes the idea of dry, flaky skin, the Rêve de Miel Deliciously Nourishing Body Scrub can benefit everyone, no matter your skin type. During summer, our skin gets dryer, and as we venture on holiday, the idea of smooth, glowing skin is what we’re all looking for, so this review will be right up your street. Translated into English as ‘Honey Dream’, the Rêve de Miel Deliciously Nourishing Body Scrub is just as delicious as it sounds. Read along to discover all of the exquisite benefits that are infused within the latest sticky, sweet launch from Nuxe. I know what you’re thinking; a body scrub is just a body scrub. 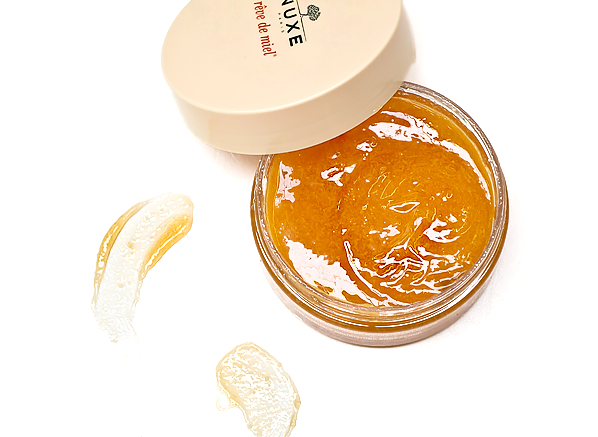 But not this one, the Rêve de Miel Deliciously Nourishing Body Scrub is a game-changer. Packed with buffing nourishment, this 2-in-1 scrub removes dead skin, whilst hydrating your skin. Technically, you could call this a 3-in-1 really, as the protective layer that it leaves on your skin after exfoliating is well worth mentioning. Mixing the super buffing powers of small rice grains and large sugar crystals, this softening body scrub renews, smooths and scents your skin. As soon as you open the pot, a flourish of sticky floral fragrance fills the room, its nearly edible scent is a real treat for both your skin and senses. Warning: you may get the feeling that you want to eat it, but please don’t try that at home. Containing 93% natural origin ingredients, the Rêve de Miel Body Scrub can be used on even the most sensitive skin types. Here’s a mini breakdown of what’s inside its delicious formula. • Sugar Crystals: The larger grains within the formula, Sugar Crystals buff away dead skin cells. 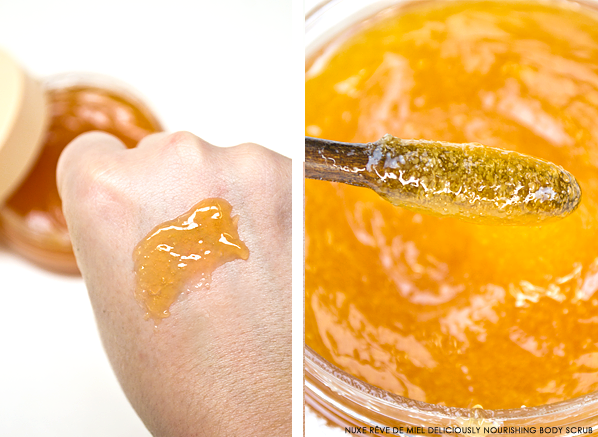 • Honey: Full of antioxidants, honey protects and moisturises. • Rice Grains: When in contact with skin, these tiny particles warm to easily remove flaky skin. • Precious Oils: A mixture of sunflower seed oil, argan oil and borage seed oil repairs your skin. • Shea Butter: Filled with essential fatty acids, shea butter cocoons your skin in moisture. • Caramel: The sweetness of caramel gives the Rêve de Miel Body Scrub its delicious scent and sensuous texture. Even if your skin isn’t dry, the Rêve de Miel Deliciously Nourishing Body Scrub will be the perfect pamper that your skin needs. Perfect for a pre-holiday/pre fake tan prep step, or weekly treat to keep your body soft and radiant, this luxurious body scrub will buff your dead skin cells to improve circulation, revealing an even texture and tone to your skin. Top tip: For a more powerful scrub, buff the Rêve de Miel Deliciously Nourishing Body Scrub into dry skin in an upwards, circular motion. • Nuxe Huile Prodigieuse Celebrates 25 Years! My lips feel very soft and hydrated after using this. This entry was posted on Monday, August 14th, 2017 at 11:30 am and is filed under Bath & Shower, Brand Focus, French Pharmacy, New products, Spotlight On, Tried & Tested. You can follow any responses to this entry through the RSS 2.0 feed. You can skip to the end and leave a response. Pinging is currently not allowed.